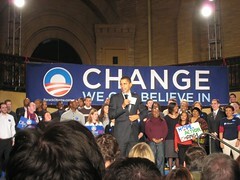 Kristi and I went to a rally for Obama in Boston last night. It was much bigger than I expected, though in retrospect I think I should have expected more. It was my first time at a political event of any kind. 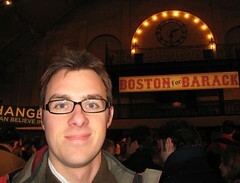 I enjoyed it a lot, despite all the standing around. He invited everyone to head up to New Hampshire to volunteer there (reminding us “its only an hour away”), so who knows, maybe I’ll try my hand at canvasing one of these days.